Serika Itou celebrates the successful launch of the Team E’s rover. 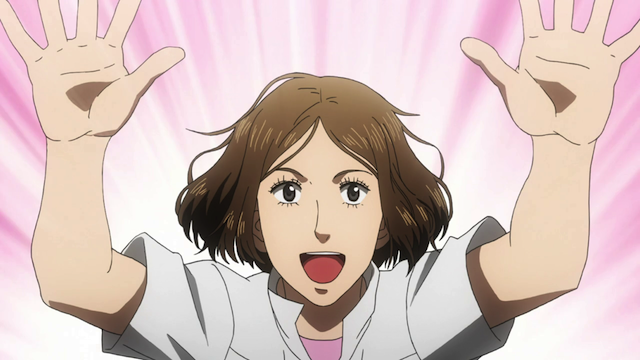 Space Brothers episode 60 seems to be the conclusion of the Comeback Competition arc. Honestly this show can move pretty slowly at times, but that doesn’t change the fact that it has a fresh storyline. I suppose the story will now turn to Hibito’s return from the moon. I’ll be a little sorry to see the attention shift from the engineering competition, because I think that it was a great idea for a story — someone should do a whole series based on this premise (and NOT have it turn out like Robotics;Notes). The recap made the pacing worse but I am glad we are back on the trail of some excitement. I’m still worried about Hibito’s team landing that Pico’s fearful for. And I also hope Amanti’s weird reaction against Mutta was the fever and nothing more.